Infused with fragrant saffron and almonds, this sweet dessert is simple to prepare but nonetheless looks and tastes impressive. Mix 4 tbsp. milk with the ground rice and mix until the consistency is that of a smooth paste and then set aside. Bring the rest of the milk to the boil (which will take around 10 minutes) and add the sugar, stirring for 10 minutes until the sugar is completely dissolved. Remove the pan from the heat and add the ground rice paste. Stir well and return to the heat. Stir constantly until the mixture thickens. Boil for 5 minutes, continuously stirring. Remove the pan from the heat then add the vetiver essence and green cardamom powder and mix well. 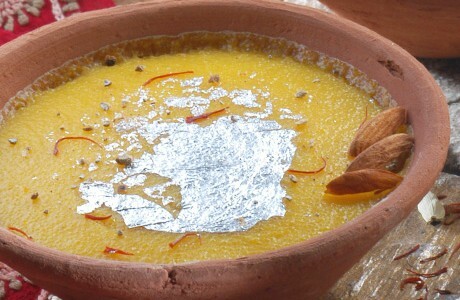 Pour the mixture into individual dessert bowls and garnish with saffron and raisins. Place in the fridge and serve once chilled.